It's a situation in which all too few of us can find ourselves — surrounded by rendered Wagyu beef fat. But when you're the bar director at Alexander's Steakhouse, a Japanese-influenced meat mecca in San Francisco, it's all part of the job. Much of the fat goes into the house grinds, but as Gedeon Tesgaye says, "What do you do with the best beef fat in the world?You make cocktails with it." The inspiration for the A5 Wagyu (named after the highest grade of Wagyu, which is a specialty at Alexander's) struck when Tsegaye was preparing for an El Tesoro tequila cocktail competition. He made the fat-washed tequila by adding the rendered Wagyu fat to El Tesoro Platinum (blanco) and then chilling it, skimming the fat off after it solidified. Wagyu, along with oxtail, is also present in a demi-glace he transformed with Japanese Wasanbon sugar and other ingredients into a rich and meaty gomme syrup. 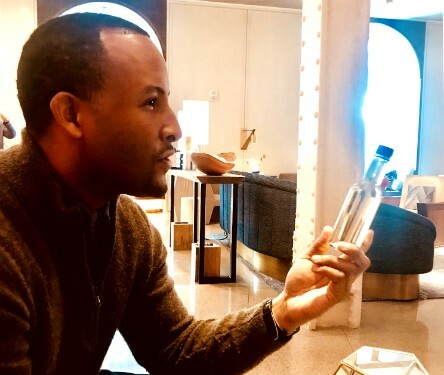 Gedeon Tesgaye of Alexander's Steakhouse with his bottled A5 Wagyu cocktail. After adding bay leaf, Alessio Bianco vermouth, and Dolin Dry vermouth, he then aged it with French oak chips before letting it rest in the bottle, a total of about six weeks in all. The cocktail may not have won the competition, but it is absolutely stunning. The nose is redolent of succulent, rich, marbled beef; it makes me want to grab a fork and knife and tuck in. On the palate, the sweetness of the infused gomme syrup dominates midpalate before the savory notes come back to the fore. The meatiness of the Wagyu and the vegetal notes of the agave are a stunning combination; Tesgaye said he'd originally wanted to use a reposado tequila, but the heightened agave notes of the blanco round it out beautifully. A single ice cube helps dilute the sweetness a little and evens out the drink somewhat, though it also mutes the Wagyu influence a touch. Even if you're a devotee of fat-washed cocktails, it's unlikely you've tried anything like this before — it's light-years away from your typical bacon fat-washed bourbon drink. Right now, it's an off-the-menu special at Alexander's, but requesting it will get you a 2 oz. pour ($45). And if you're planning to get your fill of meat on a plate and not in a glass, Tsegaye and crew have more than a dozen specialty bottle-aged cocktails currently behind the bar, ready to pour. Spirits/cocktails writer — whisk(e)y & rum a specialty, but I'm an equal-opportunity boozist — for Robb Report, HuffPost, Serious Eats & elsewhere since 2007. Spirits/cocktails drinker for far longer. Stay-at-home dad, 20th century music enthusiast, eater of dumplings. Opinionated but generally pleasant about it.